Is the sentence, “Stop Jumping on the couch” a common one in your household? It should be no surprise to you that children love to jump. With a trampoline, you can let your child bounce as much as they want and not have to worry about your furniture being ruined. In addition to protecting your couch, the trampoline also provides several benefits to your child. Jumping will strengthen your child’s muscles, stimulate their development, and provide them with exercise. After diligent research, we created a list of the ten best trampolines. Spare your furniture and fuel your child’s love of jumping with one of the trampolines on our list! For this update, we focused on updating our review content for our existing products. This allowed us to correct various spelling and grammatical errors as well as to make sure that the product information was as up to date as possible. It has a completely no-hassle set-up that takes about 90 seconds in total. Unlike other products on the market, this is made a from bungee material, so there’s less of a chance of it warping with use as quickly. 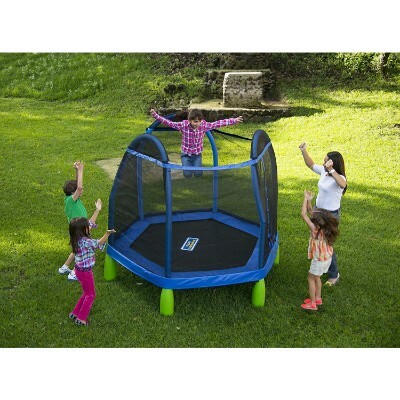 With the GetGo Foldaway it is no longer required to have a giant backyard in order to own a trampoline. This small triangular trampoline can fit practically anywhere. Assembly is super easy and will allow your child to begin bouncing almost immediately after opening. The built-in handle will allow your child to jump safely as it gives them something to hold on to. Storing the trampoline is stress-free as it is designed to fold. 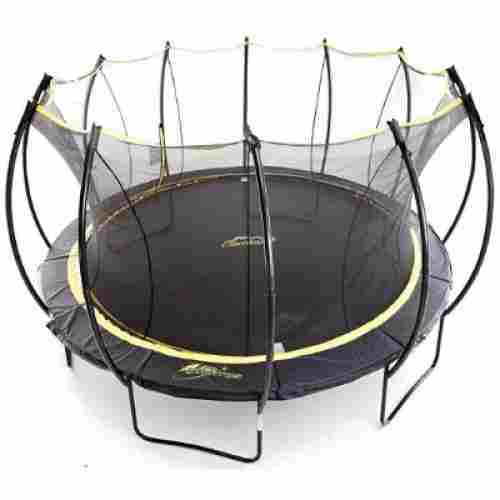 Weighing under thirteen pounds, you will easily be able to move this trampoline from room to room. The three legs provide a stable foundation for your child, so they can jump without you worrying about it sliding out from underneath them. Once you take the trampoline out of the box, unfold it and wah-lah your little one is all set to jump. It is designed with bright colors that will not only stimulate your child’s sensory development but will also get them excited to jump. 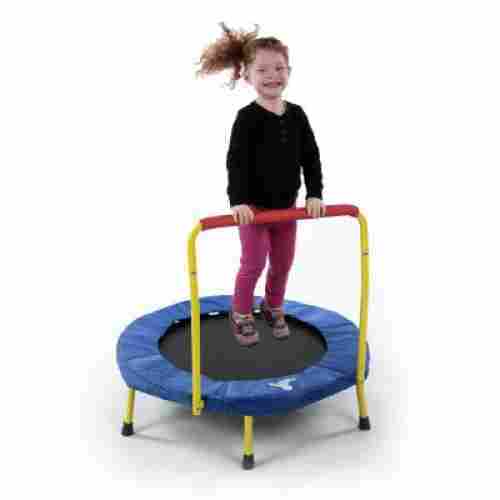 Spacious, sturdy, and easy to assemble, this little trampoline is perfect to promote healthy exercise in young tumblers! 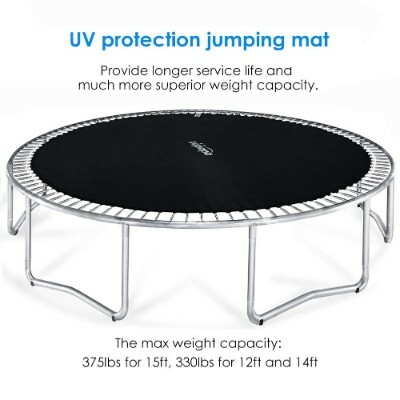 Safety and positive exercise reinforcements are key with this trampoline. As your little one bounces they experience a full body workout. Their heart rate is boosted, their muscles expand, their lung capacity grows, and their overall flexibility improves. Trampolines are also a great way to encourage outdoor play and prevent early electronic dependence. Your child will sleep well every night they use this trampoline as their body will not have to contend with excess stimulation leftover from the day. he Sportspower My First Trampoline is the perfect something fun and energetic that can use up that excess energy and reduce frustration. 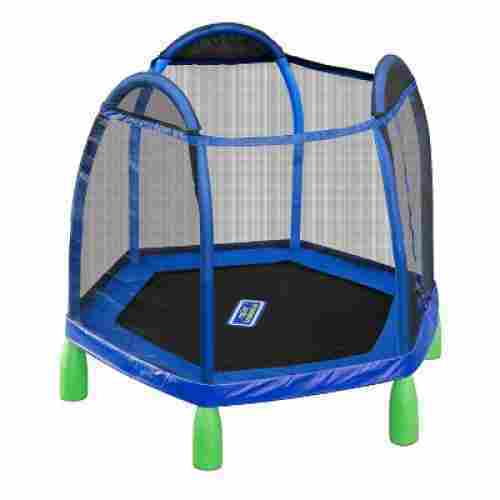 Designed specifically for ages 3 and up this trampoline includes a myriad of safety features to keep your little one tumbling time after time. This trampoline features a low-profile design so there is no reason to worry if your toddler takes a tumble. A full net-style enclosure also prevents accidental falls while the foam covered poles protect your little one in case they manage to somehow circumvent the other safety features. Best of all it will keep your little one jumping and actively promote a healthier lifestyle while burning off all of their little kid mania. Three-year-olds have a lot of energy, so much so that its difficult for mom or dad to keep up with them for more than a short burst of time. This can make it hard to manage their excess energy and, if pent-up, can often release in bouts of emotional instability which leads to tantrums. One of the best ways to reduce toddler tantrums is to focus their energy on something more constructive. Rainy days don’t have to be so bleak. 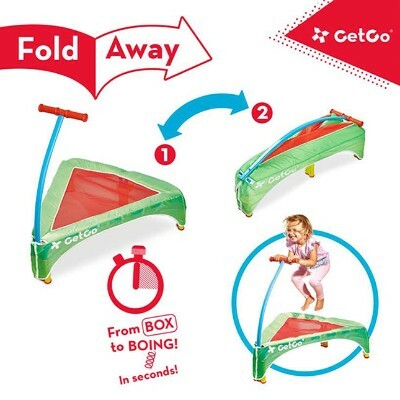 The Original Toy Company Fold & Go trampoline gives your child the opportunity to jump indoors. The small compact design makes it easy to place in any room of the house. Assembly and disassembly is easy, thus storing and relocating the trampoline is stress-free. 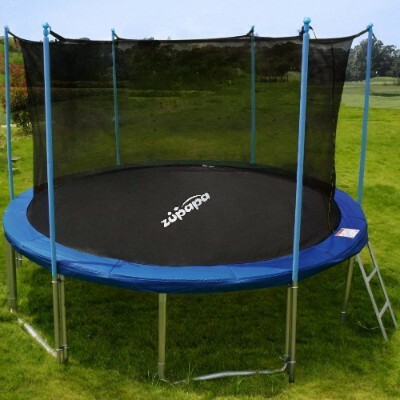 The trampoline is designed with a padded handle and frame cover for added safety. 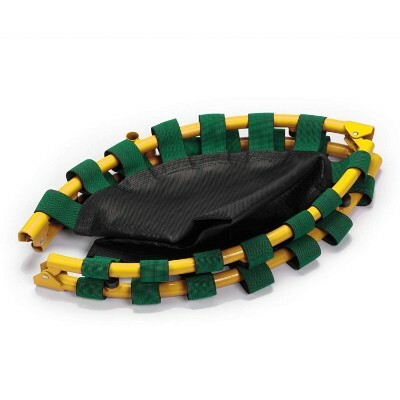 The padded handle will increase your child’s fine motor skills while also providing them with a comfortable grip. Parents with children who have ADHD especially love this product as it provides their children with a positive outlet to burn off extra energy. The frame folds and the legs screw into the bottom. With such a quick assembly process, your child can begin bouncing in no time. Whether they’re jumping indoors or outdoors, children ages three and up will have a blast bouncing for hours. The net enclosure is something that is worthwhile. At the very least, you can simply leave your kids jumping for joy right in the comfort and privacy of your own backyard. This particular model has safety in spades. From the wrap-around netting to the reinforced steel construction, it fits multiple jumpers and keeps them safe from anything around them as well as potentially messy spills inside the net. 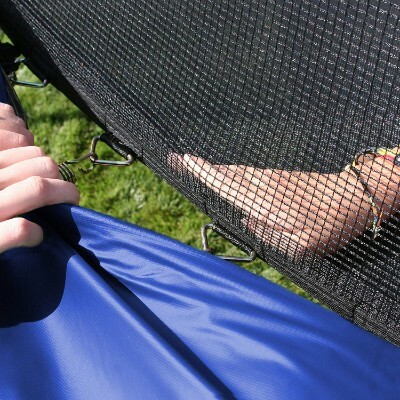 The enclosure net is also interlocked to the jumping mat via a patented button-hole feature. Its unique V-ring design eliminates gaps which would otherwise render the whole structure unstable. It can accommodate up to 200 pounds and is available in blue, green, red, and camo. It’s certified and approved by the TechnischerUberwachungsverein or TUV, the German organization tasked to validate the safety of consumer products. That should give you the peace of mind in the quality and safety of the product itself. Available in 3 sizes of 12 feet, 14 feet, and 15 feet, the TUV Approved Trampoline by Zupapa features a high quality polyester net enclosure standing 72 inches high, a 42-mm and 0.5-mm thick reinforced and heavy grade galvanized steel tube frame, and a heavy duty ladder made from deep galvanized steel to provide instant access to the 159-inch diameter jumping surface on the 15-footer. It also comes complete with a rain cover made of polyester and PVC as well as a T-hook for easier storage. This product says it’s TUV-certified, but what does that really mean? Simply put, is has received the highest safety rating possible which makes it a great purchase if keeping your family safe while they’re doing flips and jumps is your number one concern. 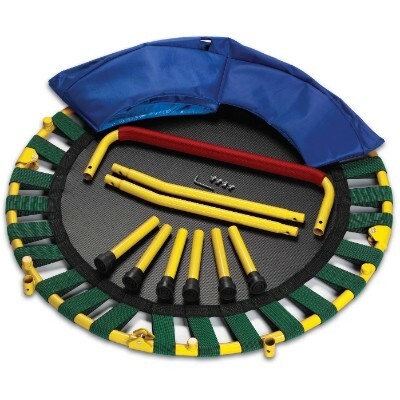 The jumping pad features 7 inch heavy gauge springs for superior bounce while the mat itself is made of UV-resistant polypropylene material. The 15 footer can accommodate up to 375 pounds of weight while the 12- and 14 footer can carry a maximum load of 330 pounds. The overall structure is simply remarkable. Plus, the concave design of the enclosure simply translates to greater freedom of jumping. 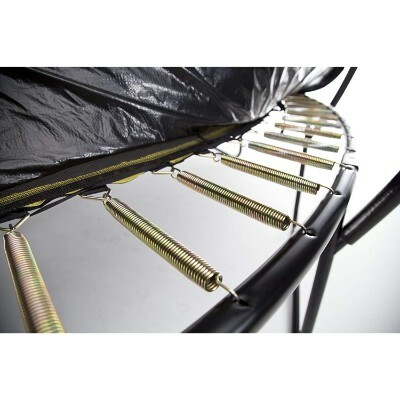 With a unique concave enclosure net, the Strator is designed to raise the bar of trampolining. 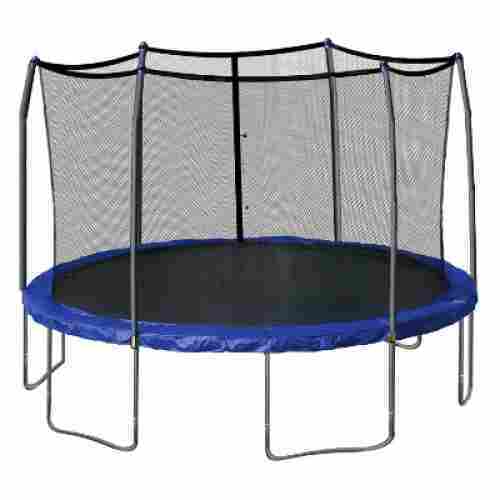 It features 6 W-shaped legs and corrosion-resistant 8.5 inch premium gold springs to provide that fantastic bounce. It also comes with 12 curved and sleek black enclosure poles providing support to its equally sturdy black, powder coated steel frame. The enclosure poles are made of a proprietary mix of pole foam and vinyl PVC material giving it superb UV-resistance. The jumping mat is safely secured by patented V-rings while the enclosure net is carefully integrated into the overall structure of the Stratos. This provides it with superb safety feature so that body parts won’t get into the different steel components of the Stratos. It is also very easy to assemble as there are no special tools needed. There are no brackets, bolts, nuts, screws, and washers to think about. It can accommodate up to 330 pounds of jumpers at any given time. The unique bowl design and powder coated steel frame gives this trampoline a sleek look and will prevent it from being an eyesore in your backyard. 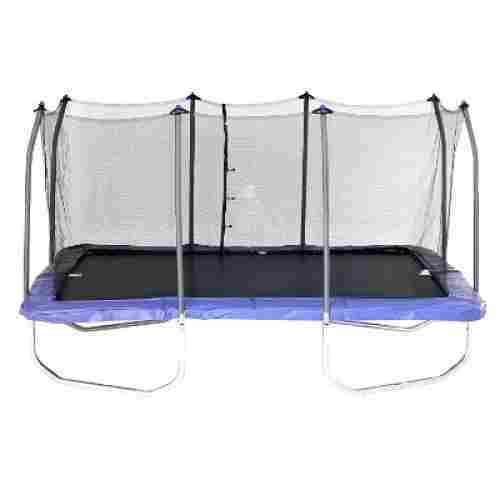 It is designed to hold up to 330 pounds, thus your child can enjoy jumping with multiple friends. 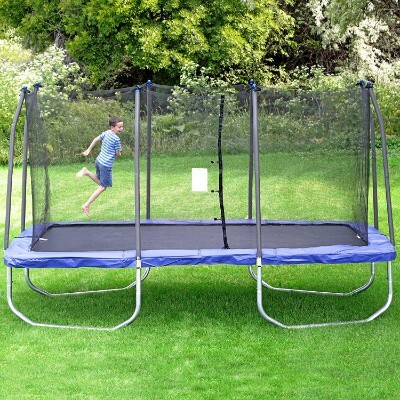 Equipped with 96 durable, premium springs, your child can jump to new heights. Serious gymnasts train on the Skywalker 15-Feet Rectangle . This simply means that when your kid does decide to take a jump, he or she can be sure of getting the best bounce wherever he or she may be in the enclosed surface area. 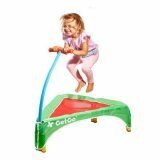 Children ages six and up can enjoy bouncing together as it is designed to hold up to 220 pounds. The enclosure poles are padded to provide a soft impact if your child accidentally bounces or falls into them. The mat is composed of a UV protected polypropylene which will provide your child with a high level of traction and prevent slipping. The reinforced T-sockets provide a highly stable foundation for your little one while they jump. The frame is composed of a rust-resistant galvanized steel, which will allow it to remain in great condition for years to come. Dunk like Jordan and soar like Shaq with this basketball trampoline! There is only one thing better than a trampoline and that's a trampoline with a basketball hoop! 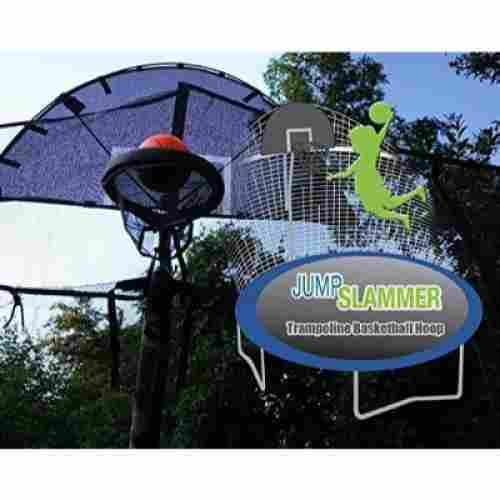 The Skywalker Jump N’ Dunk Trampoline will have your kids convinced that they are basketball virtuosos as they practice their slam dunks on this 12-foot trampoline. 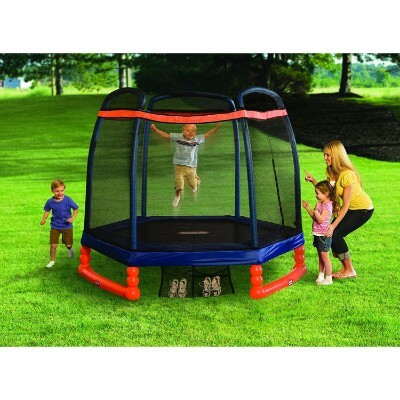 A full net enclosure designed to attach to every one of the 72 coiled springs keeps your little one’s safely inside the trampoline while bouncing. The dual zipper ‘door’ also prevents accidental slip-outs and injuries. This trampoline is designed for outdoor use only and utilizes galvanized steel coated with a rust-resistant material that is guaranteed to extend the life of your trampoline. After all, safety is number one and fun is number two but durability comes in a close third priority when it comes to purchasing a trampoline. 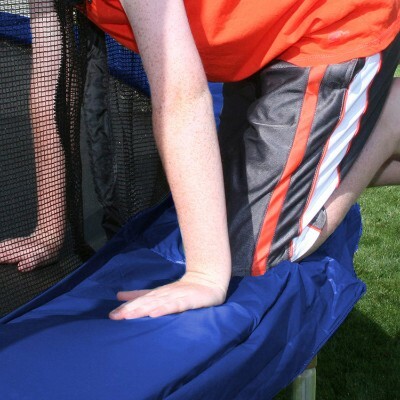 Skywalker trampolines use a patented net enclosure that attaches directly to the springs and eliminates gaps. This prevents your little one’s small feet and legs from slipping out of the trampoline while jumping. Foam padded poles provide increased stability and even further protection in the case of a fall. Even the basketball hoop itself is designed with a breakaway rim and crafted from soft, child-safe materials. Safety is paramount with this trampoline and only seconded by its ability to provide a long-lasting and enjoyable exercise experience. Your children can play their way to better health. Combining two sports is a lot of fun (well, okay, jumping may not be a sport so much as a physical activity) and serves as a time-killer for kids of all ages. We love that this basketball hoop can be used in conjunction with a pre-existing trampoline to create something that’s crazy fun. We admit it, this trampoline accessory is ridiculous in the best way possible. There’s no need to be six feet tall and have an amazing jump shot to play basketball anymore because the Jump Slammer is literally changing the game. 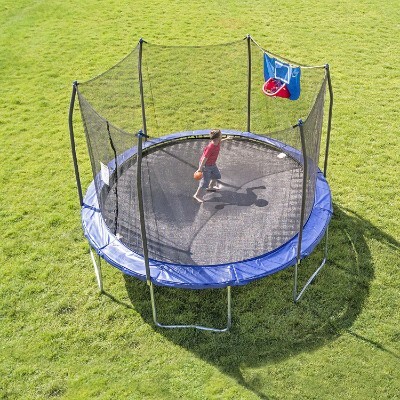 There are so many great qualities about this product that we’re not quite sure where to start but perhaps with the fact that it’s insanely easy to connect this to an existing trampoline. 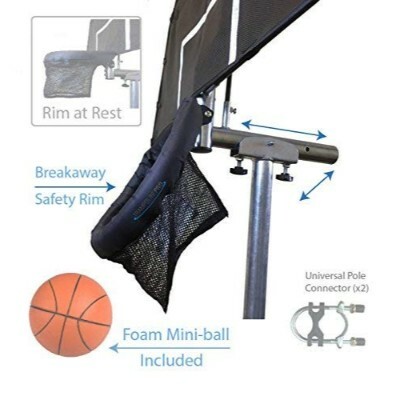 The hoop easily attaches to the pole to securely sit upright and allow your kids the chance to be basketball stars. There’s no reason why you can’t jazz up your kid’s pre-existing set-up, especially when it means more fun! This is a great add-on to increase cardio and physical activity so they’ll stay in shape and have fun doing it. It’ll change the way kids view basketball and help them increase their accuracy with a little extra-added bounce from the mat. This set comes with a foam basketball which adds to safety while also making it easier to land a shot. 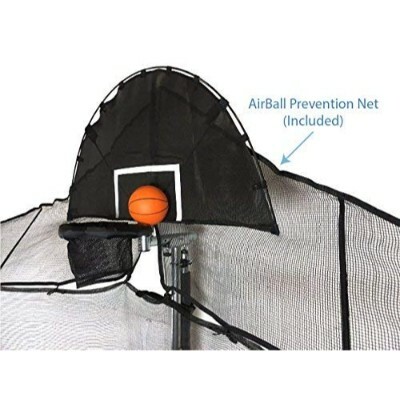 They’ll be seeing nothing but net with this added to their awesome set-up and you’ll be surprised when they easily get bored with regular, solid-ground basketball games. It’s great for all ages and perfect for group play whether they’re trying to play one-on-one or just shoot some hoops! Assembly is easy, fast, and the best part? The manufacturer offers free replacement parts, since we all know how kids can get when playing basketball. 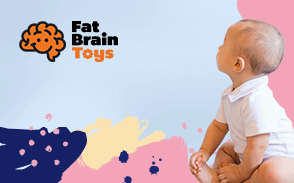 We’re always looking for the best quality products and that’s especially important in starter toys. This trampoline is a great first for kids and is built to last. The entire trampoline is made high-quality durable materials, which will allow your child to enjoy it for years to come. The heavy-duty steel poles provide the whole trampoline with stability and eliminate the possibility of it turning over with your child inside. The attached mesh shoe bag will keep your child’s shoes organized and in one spot while they jump. 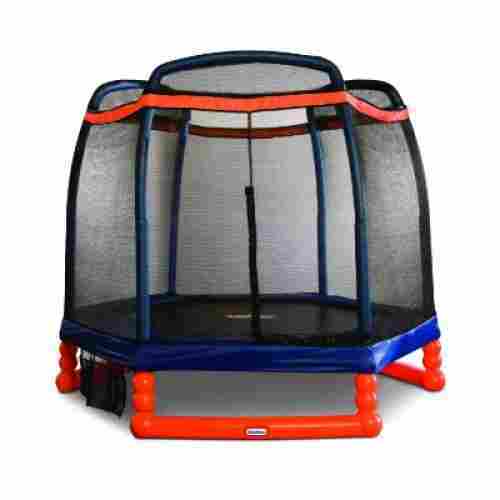 If the idea of your tiny toddler jumping on a massive trampoline terrifies you, then the Little Tikes trampoline is perfect for you. It is designed to encourage your child to be active while also keeping them safe. 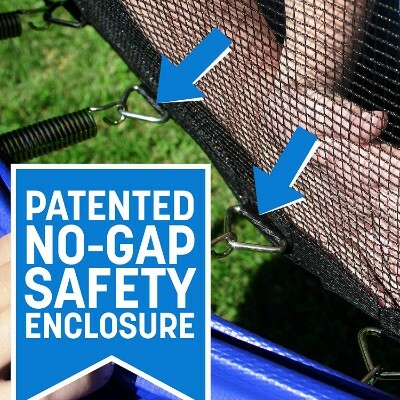 The attached safety net will protect your child from falling off of the trampoline as they jump. The springs are covered in plastic, thus preventing your little one’s hands or feet getting caught in between. 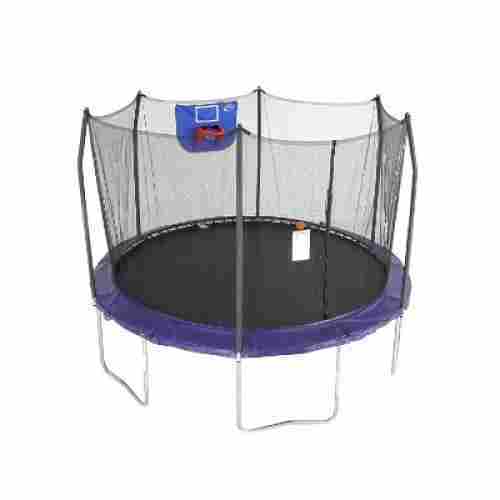 Children weighing up to 105 pounds can have a blast bouncing while you enjoy the safety features from afar. One thing we had to look at within the range and differentiation of each products was it's construction and safety. After all, trampolines initially belonged to the world of acrobats, aerial and trapeze artists! Would any of them try to do jumps and flips without some thought of safety; and, when they landed if whatever was there would break the fall?! That's what we did--ranging from the Skywalker models that use a T-Model socket for extra durability (preferable to welding, which still leaves joints weak at the places they were fused together) to the Zupapa brand that submits to TUV ratings that are of the highest European standard. All the products fall under the aegis of ATSM certification. And, most of the large, spring-loaded models undergo and anti-corrosive treatment of the springs-- typically in the form of melding the galvanized steel either with ionized zinc or copper. We continued on by giving one of the larger models more of a gymnasts safety feature in making it rectangular and providing even bounce technology. All of the larger outdoor models come with netting with the Stratos exceeding the 6-8 pole standard required. Even with the indoors toddler trampolines, very little is left to chance. 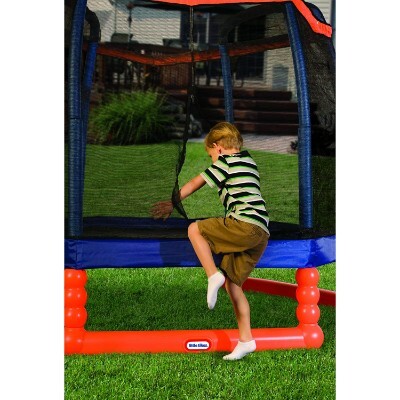 With the outdoor models focused on weight capacity and netting durability, the indoor/outdoor models for kids are designed to give that reliably catch-me-if-you-can low center of gravity that's essential. Just to be safe, there's always a trusty handlebar to hold or lean on to if needed. Research in the past few decades has already shown the fallacy of their being a separation between the body, mind, personality, and moods. Just as we all know, and have experienced first or secondhand, the phenomena of "hangriness" due to a low hypoglycemic index, thus we can think of a kid that gets antsy, sleepy, or depressed from being cooped up for too long or having a lack of exercise in general. While the level of stored energy and metabolic rate may go down with age, the benefits of an elevated heart rate don't. Nor do the detractions of low mood and lethargy from a lack of adequate physical activity. One of the major gripes of today’s child development psychologists as well as a great number of parents is the fact that more and more children are becoming victims of obesity. While some may look at it as a purely genetic thing-–with both parents on the heavier side of things and all siblings are also on the overweight equation-–child experts believe that it is a rather very sedentary lifestyle that is wreaking havoc in the young lives of children. There simply is too many calories being consumed at any one time yet too few physical activities to use up all of those calories. The end result is an overall net gain of calories that are translated into fat deposition leading to overweight, obesity, and a host of metabolic problems. Part of the problem is the choice of game that most children today play. A great majority of children play with computer or video games that, while may provide them with the necessary cognitive stimulation and the development of their dexterity, visual motor coordination, and quick reflexes, are not doing substantial in the continued development of their gross motor skills. A recent study revealed that American children are spending an average of 5 hours every day in front of computers; the numbers double on days without school. Playing with computer games does have its benefits but one of the laments of child development psychologists is the lack of physical activity. Sure, they are using their fingers to manipulate their characters in the video game. But, that is just about it. There simply is no whole body physical activity to help burn those excess calories. That is why healthcare experts agree that toys such as bikes, pogo sticks, skateboards, rollerblades, hula hoops, and trampolines can play very important roles in the promotion of physical, mental, social, and emotional health among children. And we all know the many benefits of physical exercise in the human body. Here are some of the benefits of trampolining not only for kids but for every member of the family. There are a few surprising trampolining that most people would never think of. What started out as a simple way to pass the time outside and a fun thing to do when you get together with your friends has turned into a fitness trend for kids and adults alike. The first and most obvious benefit of jumping is its perfect cardio rating. The use of a trampoline has been proven more efficient than jogging, 68% more to be exact, and is a great way for kids to stay in shape. By increasing cardio they’re exercising their heart muscle, increasing their oxygen intake, and allowing their body to shed toxins. Sweat is a good thing especially during exercise, and they won’t even realize all the good they’re doing their body while they’re busy trying to jump higher than their friends. As they get older they’ll notice a significantly improved difference in their joint function and range of motion which can be attributed to routine jumping. It’s also perfect for keeping weight in check and before you know it, your kids will be lifting more than you! People often don’t realize how important cardiovascular health is for all ages. It’s never too young to start thinking about your little one’s future health and access to a trampoline can help you and them to get a headstart on that. Cardio helps to improve a range of different aspects of the body such as circulation, increased lung capacity, and blood vessel health. This makes it the perfect activity for parents to do with their children since you’ll both be getting the health benefits that you need. Surprisingly, jumping can improve lymph health as well. With increased cardio activity, lymph nodes will both be prompted to and have an easier time metabolizing and increasing production in the body. In turn, this will eventually aid in things such as quicker healing, removing toxins that can be harmful and preventing serious illnesses and diseases. On a cellular level, it’s been shown that jumping on a trampoline as a fitness activity can also increase mitochondrial cells and help regeneration. This is great for kids since they’re so often exposed to the risk of infection and another sickness. By improving cell health, they’ll also be strengthening their immune system via their physical fitness. In addition to all of the internal benefits that trampolining can have, it also helps to strengthen the child’s muscles and their joint health. By preventing unnecessary pressure on parts of the body such as legs, feet, and knees, they’re getting much-needed exercise while saving their joints and increasing muscle mass. This can help in cases where arthritis or joint diseases run in the family since they’ll have the option to build muscle while preventing a prolonged impact on their lower joints. Because of this, muscles are required from nearly every part of your body--including your core arms, and back. This can help kids find the balance by working with their center of gravity, and dramatically increase their flexibility by stretching and working all of their muscles at once. A strong core will make for better posture and less back and neck problems later on. We can see how rebounding, or trampolining, is a benefit at all stages of life! Not everyone can get cardio in the same way, so this is something that can be easy on the knees, unlike running or jogging. As mentioned earlier, the elevated mood will help kids with the concentration in the classroom. Likewise, the same cognitive benefits can be seen in adults when it comes to memory recall. In both cases, the strengthening of tendons and bones will help in future prevention of injury. Inherently tied to product features are the company’s brand reputation and brand image. Sure a big name company can mean a lot of things but we had to look at their specialization. A small company that specializes in trampoline, we believe, is a lot better than a big name company that produces a vast array of products in addition to trampolines. Of course, this is not always the case and as such, we made sure that every indication of organizational credibility and trustworthiness are carefully evaluated. Part and parcel of this evaluation is the feedback and reviews provided by customers and other consumers who may have already tried the product. This is important as the first-hand experience counts a lot in the determination of a product’s inclusion in our list of the 15 best trampolines for really great outdoor fun. q: How extensive is TUV certification? Pretty extensive! It has plenty of time to perfect it’s standard for the 150 years or so since its advent! With time, it has become more tailored to the needs of each industry after it’s expansion since the War and reunification of Germany. Due to its expansion into satellite companies and deregulation of the markets, it has upped its game more for maintaining the gold standard of European and international safety compliance. While it has had its ups and downs--as any company with such a long history will--for the most part it has been golden it’s assessments. As always, we suggest doing your own research on any product that interests you. q: Do the extra 12 poles on the SkyBound Stratos actually make any difference in safety? Well, Stratos definitely makes the promise of extra safety and durability, not just with the assurance of giving 4-6 extra security poles from the standard, but also in the number of other guarantees--such as the 10-year warranty! So, don’t just look at the poles, which may only be the icing on the cake! The PVC foam and rubber on the poles add to it. Look to the push pin bolt technology that keeps the structure more secure than welded joints. Research the gold-plating and zinc ionizing process that prevents corrosion. Take into consideration the ATSM certification and W-shaped rafters. All of these add up to a possible standard of excellence. q: Is there any point in buying any of the indoor “kiddie” models? There might be if you don’t want your house looking like a battleground! We all know that kids can be rambunctious! And, for better or worse, times have changed! Kids have changed, and we can’t just send them out to play with their friends for a couple hours like parents used to. Same kids, different times! The health benefits for trampolining, in general, are enormous. But, if you understand the pure sense of well-being and peace that come from a happy and relaxed child, then the investments can be well worth it! q: How weather resistant are most of these trampolines? Most the ones that are advertised as outdoors pretty much will be with you for the long haul! That said, there is, of course, no guarantee. Most, if not all, have the springs treated to lessen corrosion. Also, most have UV protected netting to resist fading; the poles usually have some sort of foam covering and protection. It is known from one review that Zupapa’s product has withstood a few winters. That’s not to mention the fact that all of these companies tend to offer long-term warranties. Most of the indoor/outdoor trampolines, we don’t recommend keeping outdoors for very long. They tend to be made of plastic and other materials that gather mold rather easily and can be hazardous to your child’s health. 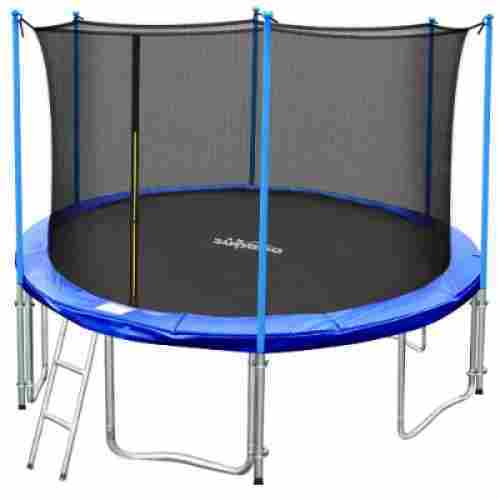 q: Do I really need a gymnastics grade trampoline like the Skywalker rectangle? Of course you don’t need it, that’s why we offer a variety of products for your satisfaction! What you will get with the Skywalker is probably a little bit more assurance in knowing that this is a trampoline that professionals trust. A rounded surface can offer more opportunities to lose footing and fall in a way that a rectangle just won’t. The even bounce technology just complements this in not allowing participants to bounce more askew to the side, or in any other uncontrolled manner. q: I keep hearing about how this improves lymph function, what difference does this make? The lymph system is probably the second most important part of our bodies after the endocrine. It is what helps to flush out impurities that accumulate over time. A clogged lymph system leads to all kinds of infections that you might not normally be susceptible to. Not only just colds and sinus infections, but the impurities also contribute to weight gain, cellulite, and acne. In older adults, an activity like trampolining may even reduce the risk of dementia and stroke that’s also related in such a way.